It looks like we’ll be treated to chapters focusing on the Crain children individually, weaving from past to present in an effort to show the traumas they each experienced in Hill House, and how those experiences shaped their characters and futures. “Open Casket” is a close-up on Shirley, the oldest Crain daughter. Shirley deals with her trauma both by facing it square-on—becoming an undertaker in response to her childhood confrontations with strange and awful deaths—and by repressing all of the worst feelings those confrontations brought up. 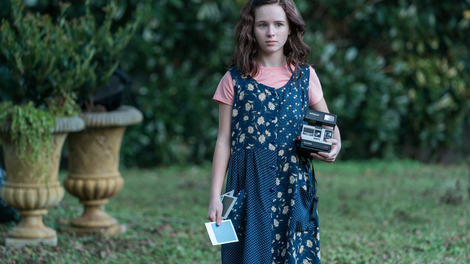 It was inevitable, which is another way of saying “predictable but fitting,” that having opened with a montage of Shirley “fixing” Grammy for Max, the episode would wrap up with a scene of Shirley “fixing” Nell—for her family, for Nell, and especially for herself. It’s a brutal task to set herself, but her family begging her not to doesn’t dissuade Shirley—not from doing the bloody, sorrowful work, and not from using it as a cudgel to punish her siblings. 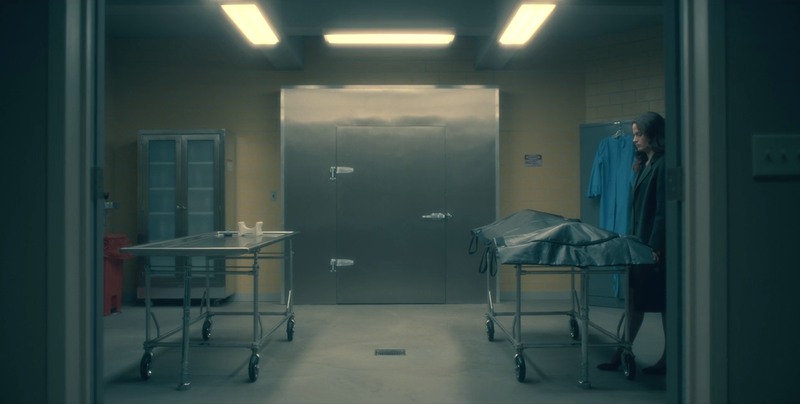 But too much in “Open Casket” is inevitable, which is also a way of saying “just plain predictable.” Predictably, while exploring a dim outbuilding of Hill House, Shirley finds something cute (a litter of kittens! )—and something terrifying (a wasp’s nest with a face!). Predictably, her little sister turns subtext into text: “There’s five of them like there’s five of us.” Predictably, the littlest kitten dies off, just as the littlest Crain has died in present day. Predictably, all the kittens perish despite Shirley’s best efforts. Predictably, their deaths take a gruesome turn that scars her for life. Predictably, she sees through her mother’s lie about the last sick little kitten, and predictably that conversation turns into a confrontation that, when her mother dies soon after, will leave Shirley preoccupied both with death and with “fixing” it. What isn’t predictable, but does feel gloriously inevitable, is the grace with with Elizabeth Reaser performs. Though Shirley does plenty of yelling and crying and Large Emoting, in many scenes she works alone and silently, conveying the depth of grief and heights of love with the smallest movements of her face. It’s exquisitely deft and enormously moving. Whatever The Haunting Of Hill House turns out to be, much of its success can be placed squarely on its cast’s shoulders. The child actors pull their weight, too. In a scene where Shirl (as her siblings call her) and Theo cower from the boom of an unknown force banging on the walls of Hill House—an earsplitting din that goes unheard by the rest of the family—their terror feels real and deep. But for those among us who remember the original, whether book or film, acting can’t rescue this version from the way even this is stripped of its dreadful context. In Mike Flanagan’s Hill House, these thumps aren’t the horror of a tormenting real-life memory following the haunted person from beyond the grave. They’re just one more scary-movie cliché, the thing that goes bump in the night. But maybe, just maybe, this episode hints at some new themes, new haunting words, new meaning that it can build over the next eight episodes. When Olivia waits for her daughters to repeat back to her the words that mean “come home,” it has all the weight—and yes, the inevitability—of a motto. The words differ from conversation to conversation, but everyone in the Crain family knows: When the lights flash twice, it’s time to come home. Digital clocks do a lot of heavy lifting in modern horror, a camera alighting on their lighted numbers making it impossible to miss what time someone is jolted out of sleep over and over. That’s been true for years, but The Haunting Of Hill House is making me see it consciously—and think about how trite it is. When Shirley married Kevin, she joined the Harris family. James Harris is a recurring name (and arguably a recurring character) through many of Jackson’s works, most prominently appearing in The Daemon Lover, but popping up in so many other stories that the original title for The Lottery And Other Stories was The Lottery: The Adventures of James Harris. Is his name thematically meaningful, or is it just another example of a name plucked from Jackson’s work and applied wherever it fits?